Lydia Ernestine Becker is now better known for her pioneering work in the field of women's suffrage than as a natural scientist. 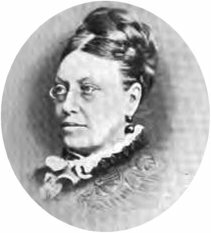 She was very clearly a remarkable and practical woman, traits perhaps fostered in part by her position as the eldest of the 15 children of an industrial chemist. In her lifetime she upset influential figures of the establishment but, no doubt, much of her notoriety stemmed from strongly held beliefs that women were intellectually equal to men and as such deserved the same opportunities. This was a deeply unpopular idea at the time and her campagning for women's enfranchisement had to wait half a century before fruition. As a naturalist she came to notice as a gold medal winner in the Royal Horticultural Society's 1864 Botanical Competition. Her practical nature is attested to by the fact that she devised and constructed her own flower press for this enterprise; a device which she considered was better for preserving the natural colouration of plants than the conventional systems in use. As a long-time member of the BAAS she was not only very active in using it to promote her views on education and women's rights, but also a keen participant in its academic scientific debates. Annotated family tree of the Beckers of Altham and Foxdenton. She has a reasonably comprehensive entry in Wikipedia. Several specimens in MANC, mainly sheets from the 1864 RHS Botanical Competition, have been scanned and documented by the Herbaria at Home project. They bear the stamp J. Lydia Becker - is this one of her brother Wilfred's grand-children? Blackburn, H. 1902. Women's suffrage: a record of the women's suffrage movement in the British Isles with biographical sketches of Miss Becker. Williams & Norgate, London. The linked transcript of a verse by the satirist William Gaspey, written in 1868, is a clear demonstration of the way in which her opinions were viewed (and feared?) by many at the time. Records the baptism of Lydia Ernestine, daughter of Hannibal Leigh and Mary Becker, merchant, of Foxdenton Hall. It adds that she was born on February 24 of that year. 1844 : Germany Lydia spent an extended period of time at the hydropathic clinic in Elgersburg run by her father's cousin, Dr Hermann Piutti. She returned late the following year. The trip was intended to improve her general health, which was regarded as poor, and it is clear that during this time she became proficient in the German language. 1863 : Charles Darwin Lydia exchanged several letters with Charles Darwin regarding a bi-sexual form of Silene dioica that she had found at Altham. She sent him seed. This slim, and financially unsuccessful publication was intended to have a companion volume on astronomy but it never progressed beyond a manuscript. She sent a copy to Darwin (see above link). 1865 : RHS Botanical Competition A Silver Medal for best collection of plants from Lancashire and a Gold Medal for one of the best collections overall, was awarded by the Royal Horticultural Society to "Miss Lydia E. Becker, Altham, Accrington." 1867 January 30 : Manchester Ladies' Literary Society 11867 February 1: Manchester Courier and Lancashire General Advertiser. MANCHESTER LADIES' LITERARY SOCIETY. - The first monthly meeting of this society was held on Wednesday afternoon, at the Royal Institution, Mosley-street. After a short address from the President, a paper was read on the "Movements and habits of climbing plants," communicated by Charles Darwin, Esq., F.R.S., &c., which excited much interest. A note was also read from Professor Babington, of Cambridge, expressing satisfaction at the establishment of the society, and wishing it success. Lydia Becker was the founder and first President of this organisation. Miss Becker, whos reception indicated how much the curiosity of the audience was centered in her, was, as she invariably is, practical, athough there was a marked contrast between Mrs Grey's rhetorical address and Miss Becker's description of the practical difficulties in enforcing the Elementary Education Act, even though it occupied but a few minutes of time, it was loudly applauded. Miss Becker, in fact, from her labours on the Manchester School Board, was able to speak with authority; and nothing is truer than such authority everywhere commands respect. 1884 : BAAS - Montreal Lydia Becker attended the BAAS meeting in Montreal, sailing from Liverpool on the "Vancouver" on August 9. THE BRITISH ASSOCIATION IN CANADA ... Mrs E.M. King arrived some time ago, and signified her willingness to enlighten the people of Montreal on the subject of dress reform; but the ladies of Montreal have not shown much enthusiasm to have their minds improved and their skirts divided, and King has been allowed to languish in obscurity. Miss Lydia Becker is somewhere in the ?? but she has not yet discovered herself to the general public. When the meetings begin her voice will doubtless be heard in Section 7. This patronising attitude is rather alarming considering Lydia had been an active member of the BAAS for 20 years. ...Mr F. Galton followed with some remarks on the palaeontological evidence for the transmission of acquired characters. He considered that the argument for the transmission of mutilations is hardly tenable. Professor Flower, Professor Vines, Professor Ray Lankester, Mr G J Romanes, Professor Marshall Ward, Professor Herdman, and Miss Lydia Becker continued the discussion for and against these theories. DEATH OF MISS LYDIA BECKER. A telegram was received in Manchester, today, announcing the death of Miss Lydia Becker at Geneva, last evening, from diphtheria.